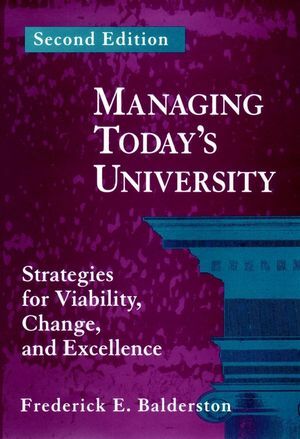 "An important addition to the library of anyone concerned with orinterested in the role of the university in today's society. Thoseof us who have devoted our life's work to improving the delivery ofeducational programs and services to students will appreciateBalderston's comprehensive view of our work setting." FREDERICK E. BALDERSTON is professor emeritus, Haas School of Business, University of California at Berkeley, and executive vice president of the Bernard Osher Foundation in San Francisco. BASIC PRINCIPLES OF UNIVERSITY ORGANIZATION. Tuition, Fees, and Financial Aid. Ensuring Viability, Change, and Excellence.